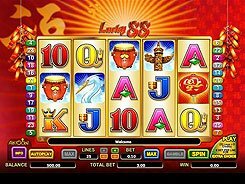 Aristocrat is known to give a Chinese twist to most of its video slots, as it is the case with Lucky 88 – a five-reel game themed around number 88 which is considered a lucky number in China. The game is played over 25 paylines and has a wild, a scatter, free spins, Dice Feature, Extra Choice feature and a random wild multiplier. A regular bet size is adjusted from $0.5 to $100 per spin, but clicking the Play Extra Choice button increases your regular bet by 5 coins and unlocks a few features that become available during the free games. The Man symbol acts as a wild that substitutes for other normal symbols and multiplies the win by a random amount between x2 and x88. Furthermore, five wild symbols appeared on an active payline award the biggest 888-coin jackpot (or $3552 on the maximum stake). A Ski Lantern is a scatter, with 3+ landed anywhere triggering the free games feature. Before the feature begins, you are asked to select the number of free spins you want to have in play and an associated random wild multiplier of up to x88 times a line bet.